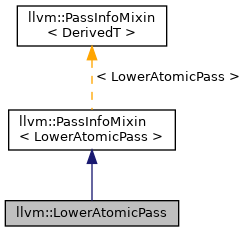 A pass that lowers atomic intrinsic into non-atomic intrinsics. Definition at line 22 of file LowerAtomic.h. Definition at line 140 of file LowerAtomic.cpp. References llvm::PreservedAnalyses::all(), F(), llvm::PassRegistry::getPassRegistry(), llvm::initializeLowerAtomicLegacyPassPass(), lowerAtomics(), llvm::PreservedAnalyses::none(), and runOnFunction().